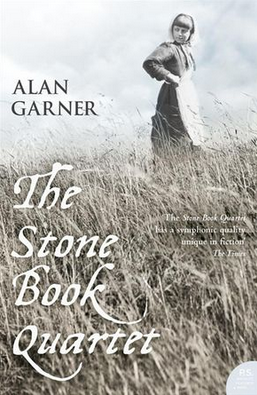 I have ordered Alan Garner's memoir, Where Shall We Run To? as a birthday present (unfortunately it's going to arrive a little late!). 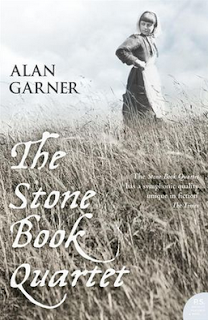 The Stone Book Quartet, the last remaining novel of Garner's I had yet to read, is the perfect preparation for it; this is Garner's most personal and autobiographical work. It consists of four very slender novellas -- almost short stories, really -- each centred on a single day in the life of a child of a different generation in Garner's family, with the last boy, William, growing up during WWII, a disguised version of Alan himself. Though the quartet is so slim, as usual, Garner packs in a dense mass of material. There are no supernatural elements here, but a deep continuity of place and memory, where family stories and history intertwine. Mary's father shows her a secret, sacred place, deep inside the hill; her son, Joseph, a 'granny reardun' (I'm guessing illegitimate?) rejects his grandfather's stonecraft to apprentice himself as a smith; Joseph's son Robert gropes to find his own place in family tradition; and finally William shares his grandfather's last day as a blacksmith and inherits a craft of a different kind. Characters from different generations and neighbouring families shift in and out of focus, and objects vanish and reappear. This is a book to treasure, a book that apparently came relatively easily to Garner, and it sings.